The space community is full of discussions about propellants: solid versus liquid, cryogenic versus storable, electric versus chemical. There is, though, arguably a more fundamental propellant for the space industry, and one that is scarcer than almost any rocket fuel: money. Without cash flow of some kind, there won’t be any propellant flowing through engines. “We were totally overwhelmed by the amount of interest we had in what we were doing,” Lewicki said, which prompted them to consider crowdfunding to tap into that interest. Raising funding has been difficult for space ventures over the years, given their high capital costs and limited interest, at best, from more conventional sources of investment, like venture capital firms. A few companies have, within the last year or two, turned their attention to a new form of fundraising called “crowdfunding” that allows them to raise money from individuals in exchange for rewards and, eventually, equity in those companies (see “Crowdfunding space”, The Space Review, April 15, 2013). Crowdfunding has, until now, looked best suited for small projects, but the impressive results of a campaign that started last week suggest it can do much more. What has changed people’s minds about crowdfunding’s potential is a project that kicked off last Wednesday. Planetary Resources, Inc., the startup company that announced plans last year to develop a series of spacecraft to prospect and eventually extract resources from near Earth asteroids (see “Planetary Resources believes asteroid mining has come of age”, The Space Review, April 30, 2012), rolled out a campaign on the crowdfunding site Kickstarter to raise $1 million to build and launch a space telescope in its Arkyd-100 line of small spacecraft. At first glance, Planetary Resources’s use of crowdfunding to fly a spacecraft seems like an odd choice. The company is backed by wealthy investors, including former Microsoft executive Charles Simonyi (who flew to space not once but twice as a space tourist), Google CEO and co-founder Larry Page, and Google executive chairman Eric Schmidt. Surely these people can spare a million dollars or more to fund a spacecraft? The idea is more than simply asking people to donate money to build a satellite. 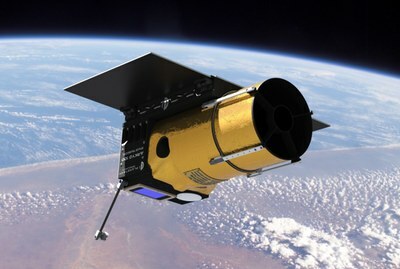 Planetary Resources is offering a range of options for access to this spacecraft based on how much an individual donates. Starting at $25, a donor can get a “Space Selfie”: a small screen on the spacecraft will display an image provided by the donor, and an external camera mounted on the spacecraft will snap a photo of that image and the spacecraft, with the Earth and space serving as a backdrop. Higher donation levels make use of the Arkyd spacecraft’s main telescope and camera. A $99 donation will give five minutes of observing time on the spacecraft to student and spacecraft teams, with the ability to join these teams and receive updates on their research. A $200 “Private Astronomer” donation gives an individual the ability to take an image of any celestial object (excluding the Sun). A $5,000 “Education Ambassador” donation gives a school extended access to the telescope plus additional educational tools. The Arkyd-100 will have relative modest imaging capabilities. The telescope, with a 20-centimeter aperture, will have a limiting V magnitude of 19, and will be equipped with a standard set of filters, Lewicki said. “We have our specific uses of what we would want to do with it, but we didn’t really want to presume what others might be interested in,” he said. He added that the spacecraft is not designed to take images of the Earth. As of early Monday, the project was more than two-thirds of the way to its goal, with more than $685,000 pledged from more than 7,200 backers. Lewicki said that prior to the formal rollout of the crowdfunding campaign last Wednesday in Seattle. The performance of that effort to date does indicate that the “Space Selfie,” and the project in general, are indeed cool ideas. As this article was prepared for publication early Monday, the project was more than two-thirds of the way to its goal, with more than $685,000 pledged from more than 7,200 backers. That included more than 2,800 people at the $25 “Space Selfie” level, and over 1,800 interested in slightly more expensive printed or high-resolution versions of it. It also includes, though, 17 backers at the highest pledge level, the $10,000 “Grand Benefactor and Education Ambassador,” whose benefits range from an invitation to the spacecraft launch to having an asteroid discovered by the spacecraft named after the donor. Planetary Resources is using Kickstarter, a crowdfunding platform that uses an “all or nothing” model: if a project doesn't meet its goal by the deadline, it receives none of the funding pledged, no matter how close it was to its goal. Planetary Resources thus cannot declare success yet with its project, but with a June 30 deadline, it appears they're well on their way of meeting, and likely considerably exceeding, that goal. The Planetary Resources effort appears to meet all three of those factors. Certainly the unique rewards offered by the company, like the “Space Seflie” images and the ability to use even a modest space telescope, have attracted considerable interest. The company has also been making extensive use of social media to promote the campaign. Moreover, it had a big rollout of the effort at a May 29 event in Seattle that featured celebrities like Bill Nye and Star Trek actor Brent Spiner. At ISDC, prior to the announcement of Planetary Resources’s crowdfunding plans, Jorgenson said crowdfunding was useful for small projects, and for bridging the gap between initial “friends and family” fundraising for a startup and somewhat larger investment by individual “angel” investors. However, he was skeptical that crowdfunding for space projects could raise large sums of money. “If you aren’t selling a video game, a 3-D printer, or some really cool tech gadget, I would say don’t even dream” of raising millions of dollars with crowdfunding, he said. So as Planetary Resources moves towards their $1-million goal and beyond, it appears they have found a way to tap the public for funding unlike any previous space venture. Many companies are no doubt eagerly watching to see how they can duplicate that success to provide the propellant needed to launch their own space ventures.